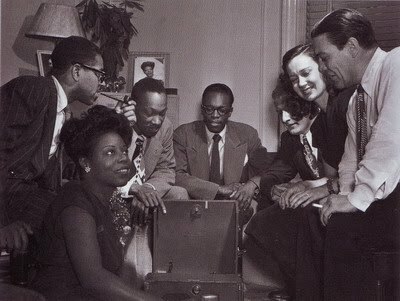 Bebop and swing cats gather at Mary Lou Williams's apartment and digging new records; from left: Dizzy Gillespie, Mary Lou, Tadd Dameron, Hank Jones, unknown man and woman, Jack Teagarden. Mary Lou's spacious Harlem apartment was a “salon” where, especially in the 1940’s, many prominent jazz people hung out, especially—though not exclusively—those musicians whose style was at the cutting edge. 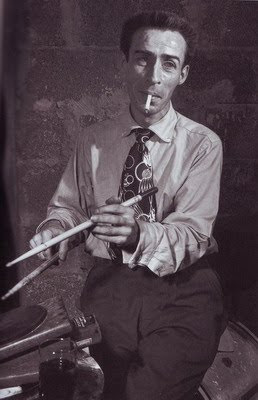 Dave Tough (1907 – 1948), a great drummer associated with both Dixieland and swing jazz in the 1930s and 1940s. 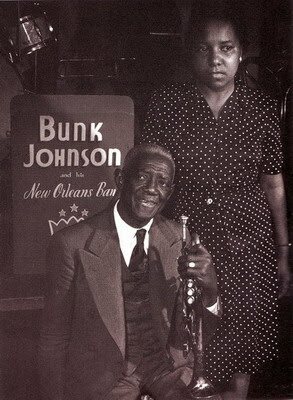 He has been described as "the most important of the drummers of the Chicago circle"
Bunk Johnson and his wife. 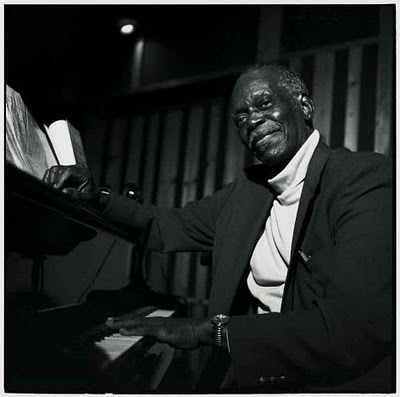 Hank Jones’s touch, taste, harmonic wisdom, professionalism, and versatility as a soloist, and accompanist or ensemble player was clear to anyone. 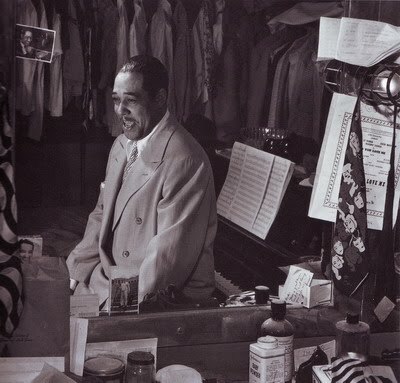 In his music all emphasis was on "beauty,” and for instance not on dexterity (which is of course one of the very first elements of a pianist like Jones, especially when you hear him as a sideman), nor on emotional eruptions like his younger brother Elvin, the great drummer of John Coltrane’s classic quartet. 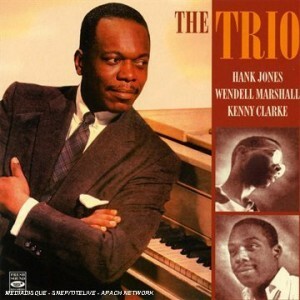 Hank’s exquisite sensitivity, and the refinement of his musical thinking, placed him high on everyone's list of favorite pianists from 1950s till very recently. I am one of them. 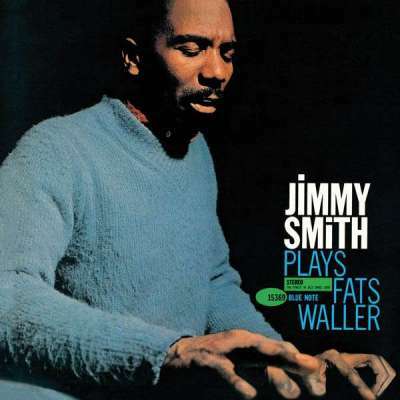 His light, harplike touch, as though he were plucking the piano's strings instead of striking its keys, and his gracefully restrained single-note style are a reformulation of their aesthetic in modern jazz terms. He was a pianist of great flexibility. He could not only "fit in" with other cats, but inspire and stimulate them, and we are talking about a wide range of jazzmen, from Artie Shaw to Jackie McLean, as well as singers of every variety, from Andy Williams to Ella Fitzgerald. 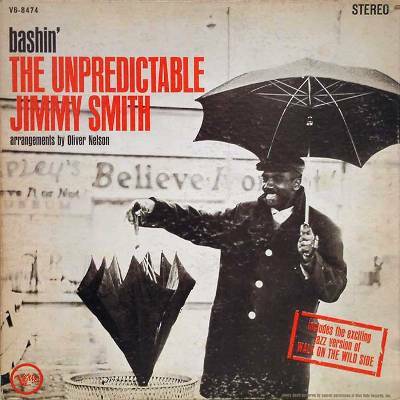 One of the best examples of this stimulation could be found in his duo with Red Mitchell (issued by Timeless label, 283), recommended by my jazz uncle, Ali-Reza Poodat, a beautifully executed record with Hank at his most lyrical touch. This afternoon I started with his quartet/quintet(s) from a 1955 Columbia session, with Donald Byrd, Matty Dice (at least to me, an unknown trumpeter), Eddie Jones on bass and Kenny Clarke. 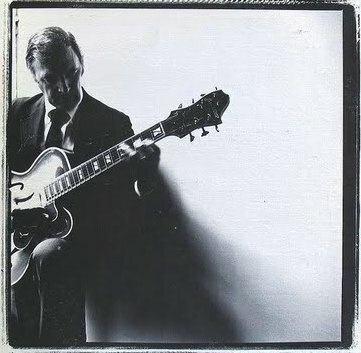 The thing that stroked me most was Hank’s modesty and generosity in giving his combo a lot of time and space for extended solos, even when the session is under his own leadership, and commercially appeared with his name on sleeve. In these sessions I love his heavily romantic interpretations of standards, and his classical way (in European sense of the word) in translating American pop tunes into a relaxing, dynamics and imaginative eccentricities. As a matter of fact I’ve always loved pianist of a gentler and more lyrical approach to the instrument. Those cats, somewhere between the aggressiveness of bebop and bluesy feeling of hard bop; cats like Hank Jones, Barry Harris, Wynton Kelly, Kenny Baron and Tommy Flanagan. While Hank Jones speaks respectfully of pianists as varied as Fats Waller, Art Tatum, Bud Powell, and Al Haig, his playing derives more from the Teddy Wilson and Nat Cole. I can hear these influences in the works of Kelly, Harris or Red Garland, too. What can I add to this, except listening to Hank with these certain qualities in his music, will never make me tired. There are always lot to hear, lot to groove and lot to be mesmerized. That’s what I call, in my very limited vocabulary of jazz, a PERFECT musician. God rest his soul. جیمی اسمیت سلطان ِ بلامنازع ارگ هاموند (هاموند B3 یکی از انواع کیبوردهای الکترونیک رایج در جاز) در سال‌های 1950 و 1960 بود. مایلز دیویس او را به فهرست عجایب دنیا اضافه کرده و «هشتمین شگفتی عالم» می خواندش. تاثیر شیوه نواختن او نه تنها بر تمام ارگیست‌های جازی که پس از او آمدند، بلکه در زنده شدن دوباره این ساز در موسیقی راک و در سال‌های 1960 و 1970 نیز انکار ناپذیر بود. او نشان داد که ارگ می‌تواند ساز اصلی یک گروه جاز باشد و توانست با این ایده ارگ را که تنها به عنوان وسیله‌ای برای دادن ضرباهنگ‌های آتشین به قسمت ریتم ارکستر جاز بود، به یکی از مهم‌ترین سازهای تاریخ این موسیقی تبدیل کند، جایی که سولوهای نفس گیر او شنونده را میخکوب می‌کرد. مجموعه کارهایی که جیمی با این ساز و برای کمپانی "بلونُت" بین سال‌های 1956 تا 1963 ضبط کرده باعث بوجود آمدن انقلابی اساسی در این ساز و نوع به‌کارگیری آن در موسیقی جاز شد. دست چپ جیمی آکوردهایی که یادآور آکوردهای پیچیده بی‌باپ بودند را اجرا می کرد، با ضرب پایش به پدال ، باس و ضرب اصلی را خلق می‌کرد و دست راست او استانداردهایی چون Walk on the Wild Side را به hit های با ضرب بالا بدل می‌ساخت که در دهه 1960 همه جا شنیده می‌شدند. صدای ارگ او هم‌زمان نشان دهنده تلفیقی از توانایی های او در سویینگ، گاسپل، بلوز و R&B بود. جیمی اسمیت، خود به تنهایی یک ارکستر کامل، در سنت آدم‌هایی مثل وایلد بیل دیویس بود. اسمیت نواختن پیانو را از والدینش آموخت. به مدرسه موسیقی همیلتون رفت (1948) وکمی بعد(1950) از مدرسه اورنستین در فیلادلفیا فارغ التحصیل شد. نواختن پیانو را از 1951 شروع کرد و در 1953 به سراغ ارگ هاموندرفت. آن‌قدر موفق بود که بتواند در مدتی کوتاه سر از نیویورک دربیاورد و در کافه "بوهمیا" برنامه اجرا کند. در نیویورک با اجراهایی در کلوب "بردلند" و فستیوال جاز "نیوپورت" 1957 شهرت پیدا کرد. "بلونت" با او قراردادی بست و اسمیت اولین کارهایش را با تریوهایی درخشان برای کمپانی ضبط کرد. همراهان او در این آلبوم ها بعضی از مهم‌ترین نام‌های جازند: کنی بِرل، لی مورگان، لو دانالدسن، جکی مک‌لین و آیک کیوبک. دوره موفق دیگری را بین 1963 تا 1972 در کمپانی "ورو" (Verve) سپری کرد. در این دوره کارهایی با ارکسترهای بزرگ (با تنظیم نلسون ریدل) ضبط کرد و از قالب قدیمی‌اش، کار با تریو، برای مدتی بیرون آمد. در این دوران کارهایی که با وس مونتگمری انجام داده نمونه‌هایی کلاسیک و قابل مطالعه‌ از هم‌نوازی ارگ هاموند و گیتار الکتریکند. در میانه دهه 1970 کلوبی در لوس آنجلس به راه انداخت که در آن به اجرای برنامه می‌پرداخت. در دهه 1980 دوباره به اجرای کنسرت‌هایی در نقاط مختلف دنیا دست زد و نسل جدیدی از ستایندگانش را سر ذوق آورد. قراداد دوباره‌ای با "بلونت" در 1985 امضاء کرد و تقریبا تا سال‌های واپسین دست از نواختن در کلوب‌های کوچک و فستیوال‌های بزرگ برنداشت. قدرت بداهه نوازی اسمیت در ریتم‌های تند به موسیقی او انرژی و شوری منحصر بفرد می‌دهد. اسمیت بدون شک در ساز خود بهترین بود و تا امروز هم رقیبی برای موسیقی او پیدا نشده است، لااقل من خبر ندارم. سایت فوق‌العاده‌ای در این‌جا درباره او وجود دارد که شامل دیسکوگرافی ِ کامل آثار و بقیه اطلاعات ضروری درباره اوست. The Roseland Ballroom in New York City's West 52nd Street. Unissued materials: Two rejected songs from Decca. About the period: During the war the United States itself entered the record business, making hundreds of so-called V-discs for distribution to service bases. Most of these V-discs were standard popular fare by name bands, but a certain amount of jazz was squeezed in as well. At the same time Louis Armstrong was still popular but far from his glorious days of 1920s and 1930s. Beginning with a set of V-Discs cut at New York's Metropolitan Opera House on January 18, 1944. The next session is from August of 1944, when Satch cut three sides for Decca in Los Angeles. Backed by his 16-piece orchestra, he sang a couple of pop tunes, including a duet with actress Dorothy Dandridge. Back in New York at the beginning of December 1944, Armstrong cut a couple of sides with the V-Disc All-Stars. 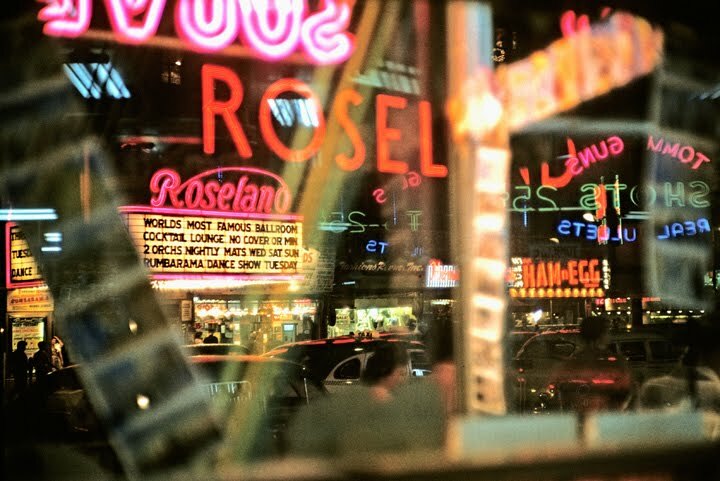 One session, held at midnight on December 7, 1944, included an all-star cast, among the musicians Teagarden and Bobby Hackett. According to one story, Armstrong walked into the studio as a surprise visitor when the session was already underway. 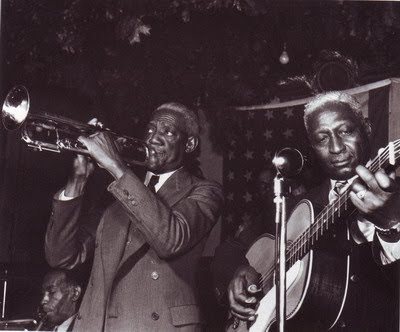 He joined a mixed bag of musicians to cut his specialty, "Confessin'," and a blues originally issued as "Play Me the Blues," which became part of his standard repertory as "Jack Armstrong Blues." 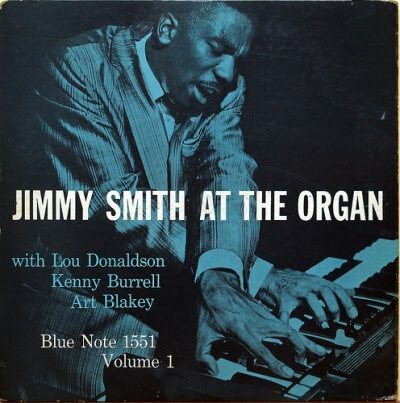 The blues features vocal exchanges between Armstrong, Teagarden, and trombonist Lou McGarity, each exhorting the other to "play me the blues," and consists largely of soloing by the principals. 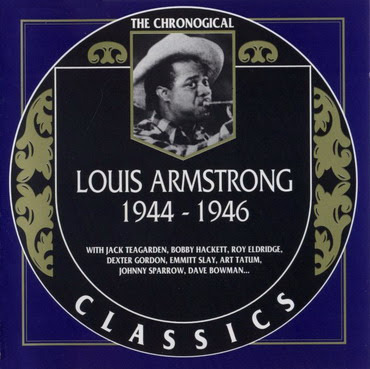 Armstrong plays a half-dozen choruses or more. His only 1945 studio recordings as a leader, apparently, were two little sides for Decca. 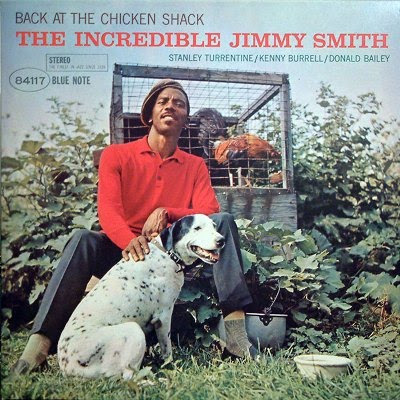 And then Esquire magazine provided another jazz context for Armstrong. The magazine had been reporting on jazz fairly regularly for over a decade. In 1943 the editors conceived the idea of a critics' poll of jazz musicians, as a kind of antidote to the Down Beat polls, which jazz fans felt were a travesty. The first poll resulted in a concert of the winners, given at the Metropolitan Opera House on January 18, 1944. Esquire continued its critics' poll through 1947. The first concert was recorded, and the winners of subsequent polls were recorded in various combinations in studios by jazz writer Leonard Feather. Armstrong won four times as a singer but only twice as a trumpet player. "Throughout, Louis parades his showy stuff, frequently on breakneck tunes taken too fast for him. He was at his worst at the Metropolitan Opera concert, flinging about random cliches, straining his way into the upper register, and generally working for cheap effects. 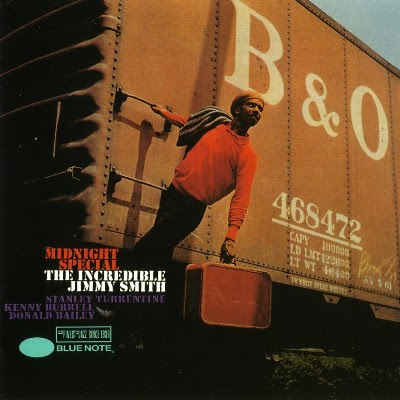 He is somewhat better on the formally organized recording sessions: he plays a nice, if familiar, solo on "Snafu," and his opening solo on "Blues for Yesterday" is agreeable, if also familiar. But on the whole, the Esquire cuts show him at or near his worst." says James Lincoln Collier in his critical study of Armstrong's work in An American Genius. Back to opening track, I still can't believe that Hawk wasn't much keen of Satch, according to his biography, Song of the Hawk. The Armstrong-Hawkins recorded collaboration with the Fletcher Henderson's orchestra, back in 1920s, ended on a low note, but Hawk took many things from Armstrong before his leaving for Chicago, even if he laughed at the drunk Armstrong, throwing up on Henderson, the night before his departure from the band. Anyway the superb opening track, Mop Mop, composed by Hawk himself, is a good sign of dissolving all problems, enmities and difficulties between two giants, as time has passed. As far as other writers comment is concerned, I prefer this one: "A delightful pot-pourri in mostly excellent sound," as been told by Cook-Morton. Louis Armstrong-t-v/Roy Eldridge-t/Jack Teagarden-tb-v/Bamey Bigard-c.J/Coleman Hawkins-ts/Art Tatum-p/AI Casey-g/Oscar Pettiford-b/Sidney Catlett-d.
New York, January 18, 1944. Louis Armstrong-t-v dir/Jesse Brown, Andrew "Fats" Ford-Thomas, Sleepy" Crider, Lester Currant-t/Taswell Baird, Adam Martin, Larry Anderson-tb/John Brown, Willard Brown-as/Ted McRae, Dexter Gordon-ts/Ernest Thompson-bar/Ed Swanston-p/Emmitt Slay-g/Alfred Moore-b/james "Coatsville" Harris-d/Dorothy Dandridge-v.
Los Angeles. August 9, 1944. Louis Armstrong-t-v/Billy Butterfield-t/Bobby Hackett-cornet/Lou McGarity, Jack Teagarden-tb-v/Ernie Caceres-cl/Nick Caiazza-ts/Johnny Guamieri-p/Herb Ellis-g/AI Hall-b/Cozy Cole-d.
New York, December 6. 1944. New York, December 7. 1944. Louis Armstrong-t-v dir/Billy Butterfield-t/Sid Stoneburn, Jules Rubin-as/Bill Stegmeyer-ts-cl/Arthur Rollini-ts/Paul Ricci-bar/Dave Bowman-p/Carl Kress-g/Bob Haggart-b/Johnny Blowers-d.
New York, January 14. 1945. Louis Armstrong-t-v/Charlie Shavers-t/Jimmy Hamilton-cl/Johnny Hodges-as/Don Byas-ts/Billy Strayhom - Duke Ellington-p/Remo Palmieri-g/Chubby Jackson-b/Sonny Greer-d.
New York. January 10. 1946. 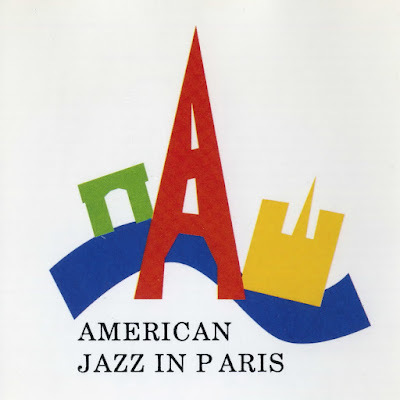 Louis Armstrong-t-v/Neil Hefti-t/Jimmy Hamilton-cl/Johnny Hodges-as/Don Byas-ts/Billy Strayhom - Duke Ellington-p/Remo Palmieri-g/Chubby Jackson-b/Sonny Greer-d.
Bob Haggart dir. Louis Armstrong-t-v/Billy Butterfield-t/Bill Stegmeyer-cl-as/George Koenig-as/Jack Greenberg- Art Drelinger-ts/Milton Shatz-bar/Joe Bushkin-p/Danny Perri-g/Trigger Alpert-b/Cozy Cole-d/Ella Fitzgerald-v.
New York, January 18, 1946. Louis Armstrong-t-v -dir/ Ludwig Jordan, Ed "Moon" Mullens, "Fats" Ford, William "Chieftie" Scott-t/Russell "Big Chief" Moore, Adam Martin, Norman Powe, Al Cobbs-tb/Donald Hill, Amos Gordon -as/Johnny Sparrow, Joe Garland-ts/Ernest Thompson-bar/Ed Swanston-p/Elmer Warner-g/Arvell Shaw-b/George "Butch" Ballard-dNelma Middleton-v.
New York. April 27, 1946. For me, the reason for returning to this incredible album was finding new materials from the session, mostly studio rehearsals, which is circulating as various bootlegs and open our eyes to a new dimension of Dead at work. The sense of spontaneous improvisation is evident in first tracks Help on the way/Slipknot/Franklin’s Tower, where they are combining jazz riffs with the most moving rock ‘n’ roll rhythms ever used by the group since mid 1960s. There are two or three unheard tunes in the bootleg that I discovered. One of them, Lazy Lightening, is a quite new one, probably a rejected song, based on a simple groovy theme and extended as a jam-like song. There are also couple of very jazzy jams. A row version of Music never stopped without vocals and reeds. It's another tour de force of master Jerry Garcia. From the beginning Garcia was playing with his Irwin's guitars, except from 1975-77, when he favored a bone-white Travis Bean. 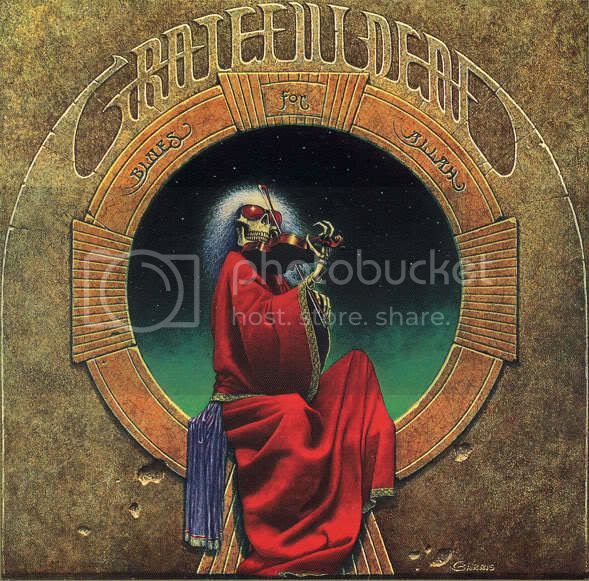 This was another fertile period for Garcia and the Dead, and it includes the albums Blues for Allah and Terrapin Station. 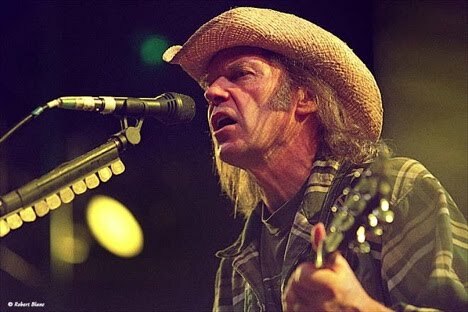 Not many changes in his playing style crop up during this era, though the introduction of some new effects did color his sound in interesting ways. Here, The Dead’s circular rhythmic pattern is most close to the music of Thelonious Monk. Their music is based on rhythmic and harmonic repetition, and they both use arpeggios as a refreshing point of changing harmonies. Dead of Blues for Allah is a psychedelic encounter between Monk in his Underground album with the fingerpickin' style and dexterity of Wes Montgomery. The tune was Volare. It suddenly appeared while iPod was doing his shuffle thing, jumping from New Orleans in her heydays to a dying super stereo session in New York of the late 1960s. This uninvited Volare was a part of a heritage inherited to me from my friend/Uncle Ali-Reza. To listen to anything from his treasury, one needs wide open ears and Volare proved it one more time. Volare started with a bright swinging vibe introduction by master Lionel Hampton that session was recorded under his leadership as Lionel Hampton and Friends in 1977. John Paul "Bucky" Pizzarelli (born January 9, 1926) is an American Jazz guitarist that has been a fixture in jazz and the studios since the early '50s. Self-taught, Pizzarelli has long been a master of the seven-string guitar. He toured with Vaughn Monroe before and after a stint in the military. In 1952, he joined the staff of NBC and 12 years later switched to ABC; in addition, he worked with the Three Sounds (1956-1957) and had several tours with Benny Goodman. In the 1970s he was more active in jazz, co-leading a duo with George Barnes and working with Zoot Sims, Bud Freeman, and Stéphane Grappelli, among many others. Pizzarelli acknowledges Django Reinhardt and Freddie Green for their influences on his style and mode of play. He is 84 now, still alive and on.